This blog is about methods to keep attention and increase productivity. The whole read should be less than 6 minutes. Good luck, and I hope you find this helpful! Cal Newport (http://calnewport.com/) wrote a great book called Deep Work, and shares many ways that you can attack the issue of scarcity of attention when doing what requires specific and focused attention on a subject. What I want to share with you here is a life hack that I borrowed from the ideas of Newport, Tim Ferris (http://tim.blog) and others, which has led to some proven success over the last few years and increased success in recent weeks and months as I have aggressively adjusted my routines to embrace these methods. Badges?! We don’t need no stinking badges! Beep! That sound of a notification sends you an audible or vibrating buzz (and fires off a shot of dopamine to your brain) in order to get you to stop what you’re doing and look at your email/phone/computer. We are living in a culture of immediacy with email, text messages, Skype, Slack, and dozens of other tools that are fighting for our immediate attention. Here is the maxim that I use: nothing needs your immediate attention, or if it does, it should be a focus not a fight. 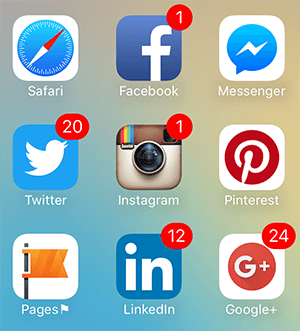 Does the number of notifications and unread items increase the anxiety and decrease your ability to focus on prioritizing your work? Number 4 is the important point as you get ready to start your focus experiment. The badge notifications showing unread account are decreasing your ability to prioritize. That’s a fact. If you have 3 things to do, you can prioritize them with relative ease. If you have 5 you start to run out of ways to prioritize due to amount of time you can think about getting them done in. Move beyond 5 into double and triple digit counts and you are off the rails on ability to prioritize and you are now swimming in attention deficit. This is where your experiment begins. What would happen if you turned off the badge counters in your apps (email, Slack, etc.) and just moved to checking on a regular cadence and ignoring the “number”? Spoiler alert: it will make you more productive. What I’ve proven with my social and work circles over the change in my habits and patterns is that if you reply immediately to emails, you will be expected to always reply immediately to email. If you need to be reached quickly, there is an expectation that every channel is a path to immediate response. It also means that every time to stop to pick up a message/notification it takes your attention away from another task. For my work, Skype and iMessage are the two methods that I have highlighted as more immediate accessibility. Skype is the primary chat method for work and iMessage is the one thing I do check as my family uses it. You must also train yourself to not answer every message or check every message immediately. If you’re in a group chat, let it roll by for a while and shake off the dopamine-triggered response need that we all have. We are literally fighting off biology and deep-rooted psychological responses here, for our own good. Over the course of a pattern training you will find the you can differentiate better between prioritizing and just attention-stealing tasks and notifications. The schedule does not create the habit as much as your desire to use the schedule as a way to create the habit. What I mean is that you have to strive for the goal of stretching out the attention-eating activities and use the attention-focused times towards more tasks which need deeper thought and focus. If you’ve stuck it through to this part of the blog, you have given yourself the first positive result. just by spending the 3-5 minutes reading this has proven that you are keen to know how to keep attentive to a task. Did you know that the average time spent on most blog articles hovers around 1 minute? It isn’t that you read them in 1 minute, but that most people start to scan, scroll, and then skip the content as attention fades. REMEMBER: Your goal here is to focus attention, not to ignore things. This is about being able to more effectively attach focus and prioritization to a task or set of tasks and to increase the flow of work. You may even find that the task is a 2-3 minute task but even in that 2-3 minute period you might find yourself thinking about something else or reaching for your phone to check a notification which cuts into that productive time. This will undoubtedly help when you need to dedicate deep attention to things like reading a long-form book or article, writing, programming, requirements gathering for a technical project, or other tasks that need warm up and undivided attention. Another bonus effect is that you find yourself looking up instead of down into your phone when there may be something or someone who needs your attention.